Congratulations to FF Mike Meyer on receiving the Emily Trevor/ Mary B Warren Medal. On December 14th 2016 FF Meyer had the most coveted position in the FDNY, Ladder 120- Irons. Ladder 120 responded to 10-77 box 1675 only a few blocks from quarters and the company effected the rescue of (7) 10-45s from the top floor apartment of a project building. FF Meyer acted decisively under extreme stress and fire conditions. 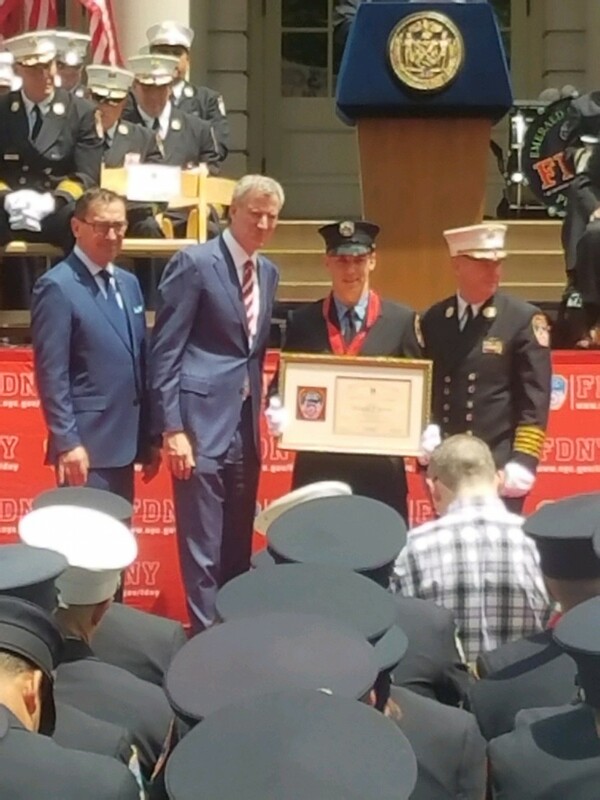 FF Meyer is well deserving of this award and is truely a professional firefighter. Congrats and atta boy Mike. Finishing up another busy night tour in Brownsville Brooklyn, Ladder 120 responded to smoke from the top floor of a project building in the Howard Houses. Just a few blocks from quarters they arrived quickly to see fire and multiple people in peril at the top floor windows. FF Meyer assigned the irons for the tour forced the apartment door and was met with heavy smoke and heat. Hearing screams of trapped occupants to the left, FF Meyer without the protection of a hoseline, crawled past the fire to the right, into the living room, where he was notified by Capt. Thomson that he found a 10-45, the first of 7 victims at this fire. FF Meyer assisted Capt Thomson in removal of this victim past the fire out of the apartment into the stairwell. Immediately, FF Meyer re-entered the fire apartment again passing fire without the protection of a hoseline to search for more occupants. Heavy fire was rolling over his head as he searched deeper, he came across a second 10-45, unconscious on the floor. He radioed command of the second 10-45 and removed the victim. FF Meyer then re-entered the fire apartment. Engine 231 had its line in place but still did not have water. For the fifth time FF Meyer crawled past and under heavy fire in the kitchen and hallway to search for additional victims who were still trapped in the apartment. Seawrching down the hallway, he entered the first bedroom and found an unconscious baby and two conscious victims who were breathing air through an air conditioner. He then radioed a third 10-45 and FF Meyer provided medical assistance to the baby all the way down to the street. FF Meyer subjugated his own safety to crawl past and under fire five times to save multiple lives. His actions gave these victims a chance at survival. Operating under brutal conditions, he responded with courage and intelligence. FF Meyer is honored today with the Emily Trevor/Mary B Warren Medal.